I priced brisket for my Seder last week, and I must admit I was a bit floored by the prices. When you host a big family Seder like I do, you need a lot of brisket. I’ve been known to cook up to 7 large briskets to feed the crowd. We’re talking hundreds of dollars for one Seder! This year, with the economy sluggish and so many out of work, I wanted to come up with a more economical alternative for the Seder meal. 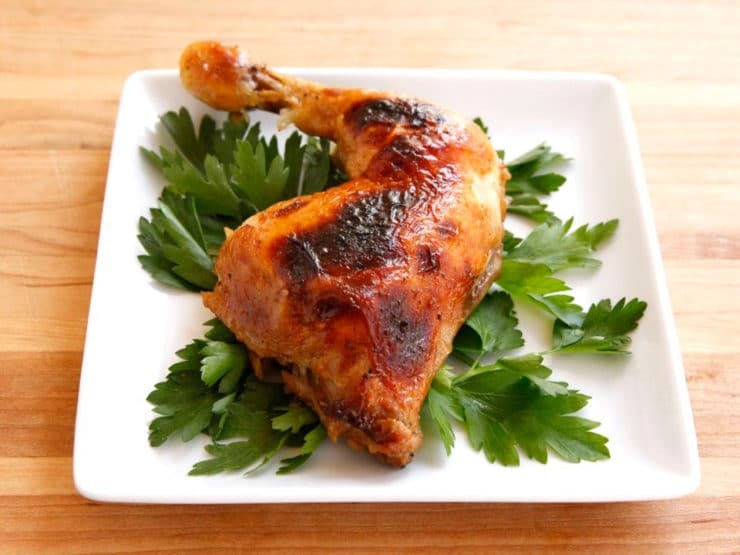 I developed this Honey Garlic Chicken recipe as a less expensive entree option for the Seder. This golden, crispy-skinned chicken with sweet, rich honey sauce will add a delicious flavor and aroma to the Passover table. While brisket is the “norm” for most Jewish holiday celebrations, chicken can be a great alternative. It’s easy to cook, economical, and pretty much everybody likes it (except for vegetarians!). Since most of us serve matzo ball soup at the Seder, I wanted to give this chicken a different flavor… something to set it apart from the savory chicken broth. I went in the direction of sweet, choosing a honey-based marinade with a little Meyer lemon juice and lots of fresh garlic mixed in. The combination of garlic and honey is absolutely mouthwatering. For this recipe, I like using whole leg and thigh pieces. Dark meat has more flavor, and it cooks up so juicy with this marinade. If you’ve got breast meat fans in the crowd, bone-in breasts will work great too. Don’t use boneless skinless here, the bone-in meat cooks up much more flavorful. I like to put the chicken pieces on a pretty platter in the center of the table, then guests can choose which cut of meat they like best. You can garnish the plate with some fresh parsley or greens for a prettier presentation. Serve the chicken with a drizzle of thick, rich honey sauce (recipe below). Even if you don’t make it for the Seder, this Honey Garlic Chicken is easy enough to make any night during the week of Passover. It would also be a great option for Rosh Hashanah, when sweet foods signify a sweet new year. Enjoy! In a small bowl, stir together the olive oil, 1/4 cup honey, brown sugar, garlic, lemon or lime juice, and cayenne to form a marinade. 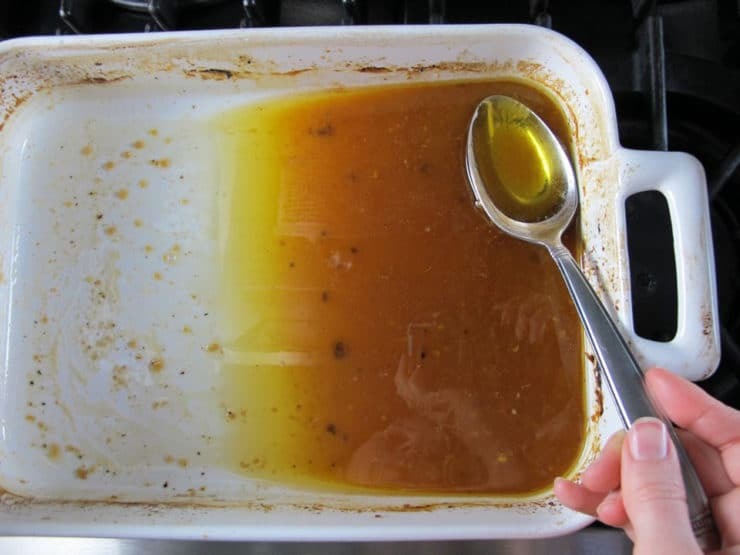 Spray the bottom of a glass or ceramic baking dish with nonstick cooking oil, or brush lightly with olive oil. Place the chicken pieces into the dish, skin side up. Season the chicken pieces with salt and pepper (if using kosher chicken, salt lightly). Pour the marinade evenly over the top of the chicken pieces, brushing them to coat. Cover the dish with plastic wrap and place in the refrigerator. Let the chicken marinate for 2 hours up to overnight. When ready to cook, preheat oven to 400 degrees F. Remove the plastic wrap from the baking dish. Spoon marinade over the top of the chicken, then cover the baking dish with foil. Pierce the edges of the foil a few times to vent. 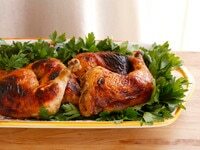 Roast the chicken for 1 hour, covered in foil, basting the chicken with marinade and drippings 2 or 3 times while it cooks. Remove foil and continue to roast for 20-30 more minutes till the skin becomes dark brown and crispy. It may blacken a bit in places due to the sugar content of the marinade. 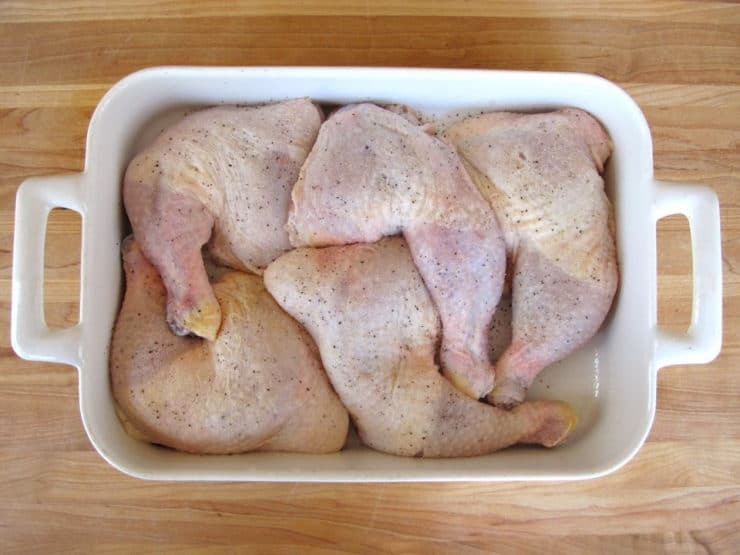 Transfer cooked chicken pieces to a platter. 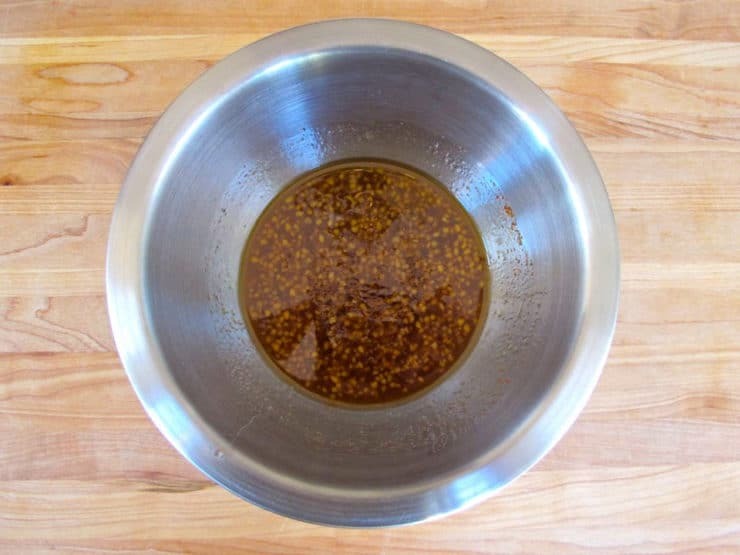 Carefully tip the baking dish so that the pan drippings and juices gather in one corner. Use a spoon to skim off the clear liquid fat from the top, separating it from the solid drippings. Discard the fat. 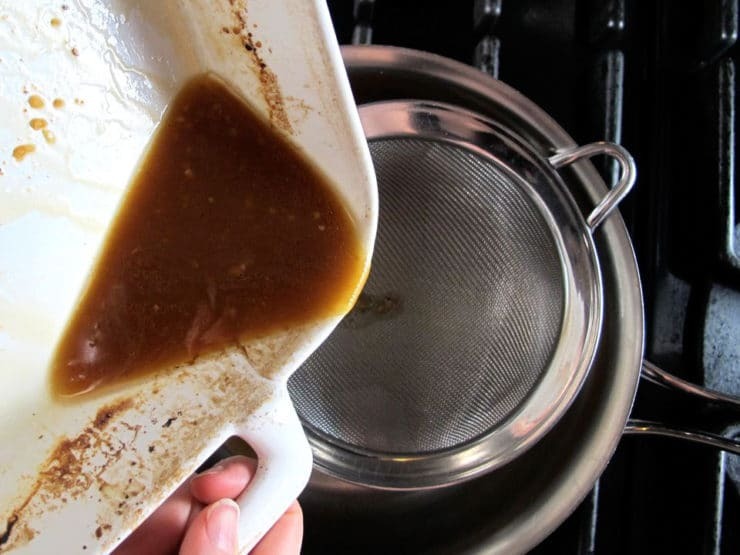 Strain the remaining drippings through a mesh strainer into a small saucepan. Heat the sauce slowly over medium. While sauce is heating, in a small bowl stir together 2 tsp potato starch and ¼ cup cold water till dissolved. 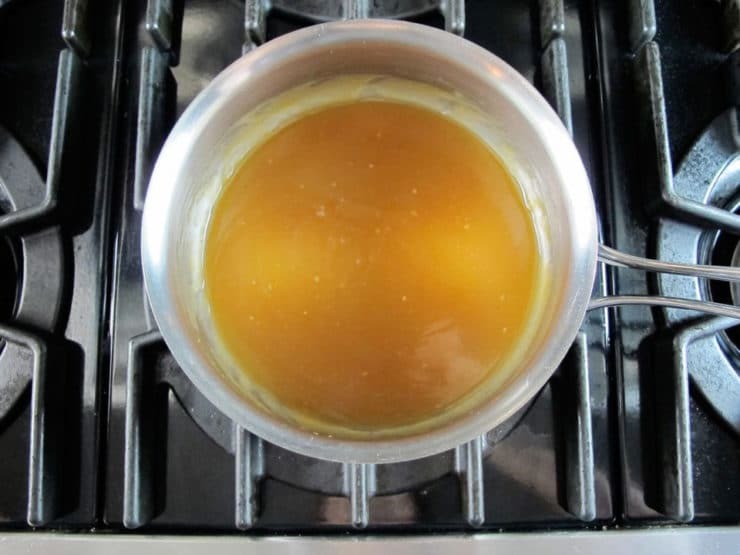 Add the starch mixture to the pan drippings, along with 1 tbsp honey and ¼ cup white wine or chicken broth. Stir the sauce over medium heat till it thickens and bubbles around the edges. If sauce is too thick, add more water or chicken broth. If the sauce is too thin, let it simmer till it thickens to desired consistency. Season sauce with salt and pepper to taste. Serve the chicken pieces drizzled with warm honey sauce. Just did a trial run of this recipe before Passover. My guests took seconds and couldn’t stop raving about how delicious the chicken was. I am so excited to have found a new, easy chicken dish that I can easily serve for Passover and everyday. This is a must try. My daughter doesn’t eat nightshade vegetables. What should I substitute for cayenne pepper and potato starch? Also, how to cut meat for some small eaters as well as hearty eaters. Some breast, some dark meat. Need to fit in oven for 14 for Passover. Thanks. I have an additional question. Since I will be baking/roasting chicken parts for 14 people, I will need to use 2 large pans on 2 racks in the oven, one over the other. How high or low should the racks be and how often should I alternate their position? Place the racks as close to the center of the oven as possible while leaving room for the baking pans. Alternate their positions halfway through cook time. You could try using a couple of tablespoons of horseradish as a substitute for the hot sauce. Corn starch can be subbed for potato starch if you are not concerned about kitniyot; otherwise, you’ll need to find some other Passover-friendly thickening starch. I want to make this chicken for Shabbat and don’t have potato starch. What do you recommend that I use as a substitute? Thanks and Chag Purim Sameach! Hi Dorit! You can use corn starch. Chag Sameach! Absolutely delicious and easy to make! 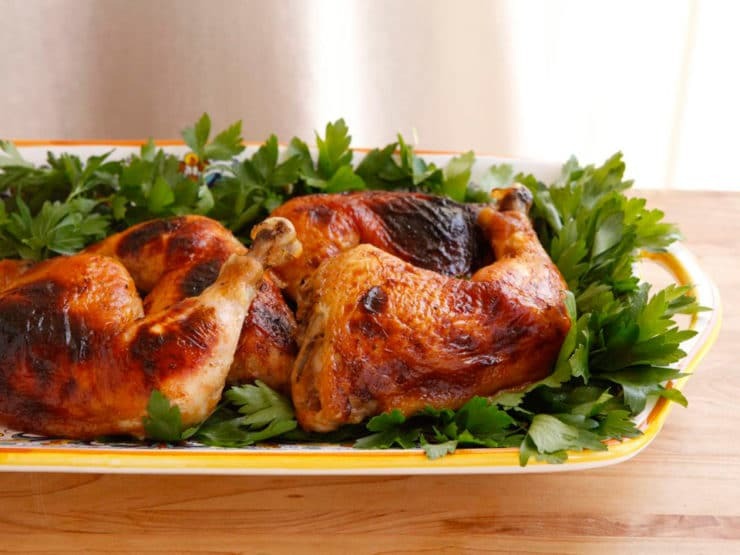 This recipe saved the day after my mother’s kosher butcher closed and we couldn’t find the Cornish hens we usually make for the first Seder. It doesn’t hurt that the mixture of honey and garlic made the kitchen smell amazing. Even my four year old loved it. Has anyone tried this in an instant pot? Trying to cut down on the amount of stuff in my oven, and most chicken recipes turn out good in the pot! I just made it in my Instant pot! I marinated the chicken for about an hour. I used Flo Lum’s (youtube/blogger) equation for cook time, which is to multiply the weight of the chicken in pounds (lbs) by 5.5. My chicken was 4.3lbs, so 4.3 x 5.5= about 24min. I first browned the chicken on all sides on Saute Mode. I then added 1 cup of chicken broth and set the timer to manual for 24 min. When the chicken is done, I did a quick pressure release. At this point the chicken is fully cooked, but I wanted the skin to be crispy so I then put the chicken with all of the drippings in the oven for 10 min at 425 degrees. I poured the drippings right on the chicken, but you can easily strain the drippings and make the honey sauce on the stove while the chicken is in the oven. In all, it was fantastic and super quick!! We always have chicken. Its delicious! I am planning on making this with a whole 4 pound chicken. Would the cooking instructions change at all? It will be more difficult to marinate a whole chicken evenly, so the results won’t be quite the same. Cook time will likely be longer, too. Roast until a meat thermometer inserted into the thickest part of the thigh but not touching bone reaches 170 degrees F (165 is food safe but I always let it go to 170, I like my chicken well cooked). Also you will want to keep the chicken covered for the majority of the cooking process so it doesn’t burn. Delicious! I just made this for 1st night of Chanukah. Made a few minor tweaks due to our dietary issues and also time saving (such as adding the wine directly to the marinade). Came out great. Kiddo liked it and husband couldn’t stop raving. Will definitely make this again. This recipe looks amazing! I wish I came across your recipe like an hour ago. I already committed to another this time round. But I will definitely give yours a go next time. This recipe is a hit! The perfect marinade. I cook it on a bed of mixed veggies (potatoes, carrots, celery, onion, bell pepper and garlic) and everything cooks beautifully together. Everything comes out moist and flavorful. Thank you! Rivka- do you just put the vegetables in with the chicken and let everything cook at once? ? Hi. I was wondering what temperature and length of cooking you’d recommend for chicken breasts…both bone-in and boneless. Would you change anything else in the directions if using the boneless breasts? Sorry, for some reason the 2016 comments didn’t show up at first. See them now. See that Melissa used boneless skinless breasts @ 350 degrees. Should they still be covered with foil? Should 350 be the temp for bone-in breasts, as well? How would you adjust the cooking time for breasts instead of thighs? 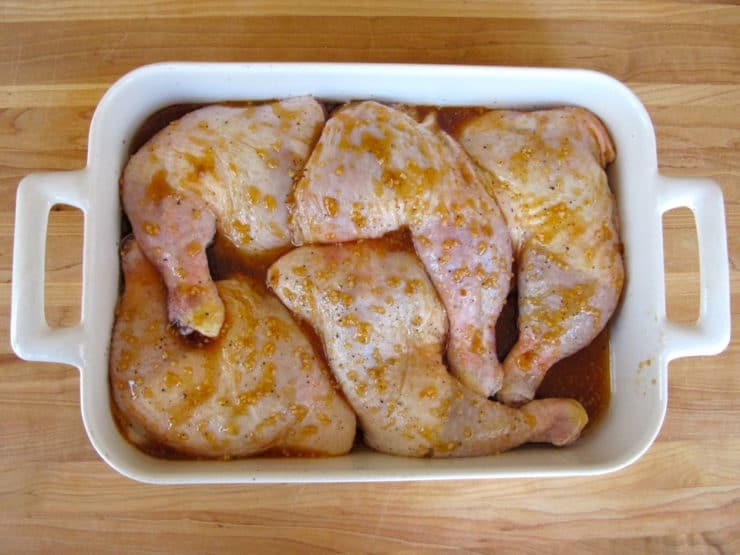 Hi Deborah– if it were me, I would pound the breasts flat, marinate, and then use the cooking instructions in this post for chicken breasts: https://toriavey.com/toris-kitchen/2011/12/smoked-paprika-chicken/ You might want to keep it a little further from the broiler so the garlic won’t burn. I took out the major breast bone after it cooked before I put on sauce and on platter. I find breast w.out bone is tougher and dryer. Perfect for Rosh Hashanah….honey garlic. Thank you for a new dish. What cooking times/temperature would you use if you were doing this recipes with all chicken breasts (bone-in skin on)? I’m making this with boneless chicken breasts. I saw someone had done this (yay!) and someone asked if you lowered cooking temperature to 350 which is what I was thinking since I don’t have skin. can someone advise? making for a seder. Mine is still marinading for the night but I did a test run on a chicken piece. It was really delicious, though I did make some tweaks. I added 2 tbsp of worcester sauce, about 1 tbsp of powdered ginger( was too lazy to grate fresh), and a heapful tbsp of black pepper. It was absolutely fantastic on the wing I baked. Thanks for the simple yet flavorful recipe. This is the best homemade chicken glaze that I have ever had. I marinated chicken breast fillets overnight in this sauce which made it have outstanding flavor! I barbecued my chicken instead of baking it, I think it turned out even better that way, I also didn’t even have to add the extra glaze on top after it was cooked. The overnight soak really added all the flavor it needed. I see you are baking just chicken tights. Will it work with the whole chicken? I like chicken baked whole better (plus my family is divided on tight eaters and breast eaters 😉 ), but I see a problem with the marinating process. Would require a lot more marinade. Have you tried it ever this way? Hi Magdalena– the recipe is for 4 pounds of chicken pieces. They can be any cut, dark meat or light meat, as long as there are 4 pounds total there will be plenty of marinade. Enjoy! Made it last night and it was a huge hit. We didn’t use the honey sauce as it would’ve taken too long in the middle of the seder. The chicken was flavorful and tender. Definitely cook it until it is a deep golden. Didn’t dry out at all. Next time we’ll make the sauce! How do I find and save this recipe on pinterest? Hi Cheryl, I would reheat it in a roasting pan/dish in the oven at 325 degrees F with perhaps a bit of chicken broth in the bottom of the pan so it doesn’t go dry, for about 15-20 minutes or until warmed through. Hi Cheryl– if they are small drumsticks, try roasting them covered for 45 minutes then uncovered until brown. For larger drumsticks (attached to thighs) stick to the recommended cook times. Hello tori. Is your honey garlic sauce the same recipe as the Chinese honey garlic sauce? I made this for our seder last night! except I used maple syrup instead of honey. It was DELICIOUS. I put it together in the morning and let it marinate all day. I used kosher chicken – the sauce at the end was perfect. Great Nina! Thank you for reporting back. I LOVE this recipe. It has become my go to chicken for Shabbat. I would like to make this for Passover but for later in the holiday (maybe Shabbat or after). Does it freeze well? Thanks! Its browning but is it supposed to get crisp the skin .Just wondering . Have a happy passover to you and yours ..
Cheryl, 1/3 cup honey is 5 tablespoons. If your skin isn’t browning nicely you might try uncovering it sooner; just keep an eye on it to make sure it doesn’t get overly browned or blackened. How should I alter cooking time if I’m only using two thigh-leg combos? Hi Laura, cooking time shouldn’t vary by much. Start by roasting it for 45 minutes covered, then uncover and continue to roast for 15-30 more minutes or until internal temp is 165-170 and skin is brown and crispy. I cooked this with chicken breasts along with some baked potatoes. Family loooooooved it. I put 2tbs of garlic and 1/2 c of brown sugar. tasted amaaaazing! I’ll have to try this on chicken wings. I made this for Rosh Hashanah dinner for the meat eaters in my family (which doesn’t include me, so I didn’t taste it), and it was a big hit — the leftovers were taken home, so I guess it was as good as reported! Thanks, Tori! Your recipes are a godsend. They are super delicious, and your instructions are absolutely simple to follow. You are really enhancing my Yom Tov meals. I am trying them one after another and coming back to them again and again. Thanks and don’t stop. That’s so kind of you Nettie. I do it from my heart, and nothing makes me happier than hearing from readers about their experience with my recipes. Thank you for writing! I made this tonight for Shabbat. Absolutely delicious! Also made the caponata-style green beans. Both dishes were completely gone! I love your recipes, Tori. Thanks Mary Ann! Shabbat Shalom! I made this for Rosh Hashannah dinner last night. It was amazing. I followed the recipe exactly and it was perfectly done! Crispy outside and tender and juicy inside. I added more garlic and used a regular lemon. It was a hit with everyone, will certainly make often. Just wondering, could I throw some small potatoes in with the chicken? What sides would you recommend? This seems like a good Rosh Hashanah dish! Hi Daniella, you can definitely make this for Rosh Hashanah. The trouble with throwing in potatoes is that they will soak up a lot of the pan drippings, so you won’t be able to make the white wine sauce. The chicken is great without the sauce too though, so if that doesn’t bother you, then feel free to add potatoes. Personally I think sweet potatoes would be ideal! Thank you! Made this for Shabbat dinner and everyone said it is a keeper. Hubby did ask if it could be spicier next time, but that is pretty normal. With half of the 8 kids still being little, I never add extra “hot stuff”. We followed the seasonings to the letter and it was perfect for all ages. The only place I veered from your cautions was that I did choose to use boneless-skinless chicken, sacrificing depth of flavor for fewer calories. It was still wonderful! We will make it again. Thank you! Did you still cook at 400″ or did you lower the temp? Im thinking of cooking with chicken breasts and am wondering whether I should cook at 325 or 350 instead? I just tried this tonight and it was EXCELLENT! It’s the perfect blend of savory and sweet! I found that the honey sauce went well drizzled on literally everything on my plate. I’ll definitely be making this again 🙂 Thanks for sharing! I made this tonight and it was FANTASTIC. My boyfriend and I both loved it. Followed the recipe to a T, the chicken came out perfectly moist (sorry, I hate that word but is there a better one for perfect chicken? ), not too sweet as I feared but perfectly seasoned. It will definitely go on the rotation for dinner parties and special occasions, thanks so much for the clear instructions. You’re welcome Desiree, so happy you liked it! Its me again do you think this will work with a Cornish hen cause i am trying it today ..im sure it will..Lets hope..
Should work just fine Cheryl! Cooking time may vary though based on the size of the hens. I just stumbled across your website this morning whilst looking for Passover pancake recipes. My kids loved the bubbelehs – thanks ! Great site and love your sense of humour. Have now printed off a few of your Passover recipes to try……. Re this chicken recipe, I have passover potato flour – is that the same as potato starch ? No, potato starch is a better thickener than flour. It’s more similar to corn starch. It is widely available at this time of year in the Passover aisle at your grocery market, or at your local kosher grocery. Happy you’re enjoying the recipes! I forgot to say that I blended the onions and the defatted juices in an immersion blender–took 3 seconds! One could also do this in a blender or processor. The chicken also stands on it’s own without the sauce. Enid i did the recipe also it was the bomb i was so impressed it is a great recipe and for me who freaks out about cooking cause i hate to disappoint there was none of that going on i opt to not do the sauce in the end but i did twik it also added orange juice to the dish .but i am going to try yours next time once again thanks to the Tori who bought this great recipe into our homes forever ..
Cheryl I am so happy your family enjoyed the recipe. Thanks for reporting back! This was a complete hit with my family! Many loud groans of pleasure and cries of “keeper!” I tweaked it & changed the final stage, so that there is no cooking the de-fatted juices, as follows, & the results were fabulous. I doubled the recipe, doubling the marinade ingredients, & used a mix of bone-in chicken pieces with skin, as well as 4 whole legs, skinned, and split. I added 1 tsp. sea salt to the marinade (1/2 tsp if you aren’t doubling). I coarsely-chopped an onion & spread it on the bottom of the pan before placing chicken in pan; after placing chicken in pan, sprinkled chicken well with kosher salt & paprika, added marinade, and baked as directed. When chicken was done, I poured off juices into a glass, put glass in freezer to separate fat from liquid, then combined with the cooked onions & 1 tbsp brown sugar to blend this mixture into a fabulous onion sauce!! I did this ahead of time and just warmed the chicken & sauce in the microwave–served the sauce on the side. Yum!! This will now be a tradition, and a regular on many occasions! Seriously are you kidding me This was the bomb Thank you so much Sadly so everyone ate to much and i had so much food for the little gang i had but with that being said the smell the look ..will take us to tomorrow evening Now tell me how should i reheat it ..these pieces of chicken so they don’t dry out i would imagine covered and add some liquid cause i threw the pan in the sink and didn’t take off marinade absolutely a fabulous dish and thanks so much for allowing us to be a part of it..
All of us who make this chicken for tonight’s seder should plan to share the comments and results on Thursday or so. I am using whole cut up chickens rather than just leg quarters because my son is a health nut and only eats the breasts.I, too, left out the brown sugar assuming that it went into the sauce and I certainly will not have any time to make sauce. By the time they eat all the other stuff, who will even know that the sauce is missing? I may add a bit of potato starch to some chicken soup and add it to the pan the last 15 minutes, but no guarantees. Good luck to all! It will be great without the sauce and the brown sugar, Helene, not to worry. Happy holiday! I was referring to the 1 tbsp brown sugar. If you didn’t include it in the marinade, you don’t need to. It will still taste great. Was inspired by all your recipes, and just poured the marinade over my chicken which I will serve tomorrow at my Seder. But I can’t seem to see when the brown sugar is added? In the marinade with the honey garlic and lemon? Or at the end with the drippings? I hope I get a reply soon, chicken is sitting on the kitchen counter! Hi Nadine– so sorry, it’s part of the marinade. I drafted this when I had a terrible head cold. I’m surprised nobody noticed the omission before now! If it’s too late for you to add it to the marinade, don’t worry, it will taste great without it too. It just adds a little more sweetness to the mix. can i make the dish without making the warm honey sauce cause i was just figuring the chicken will end up being cold unless i leave it in oven or start making the sauce a few minutes before . Hi Cheryl, yes– the chicken is great without the sauce, too. I made this for dinner last and we loved it so much we each ate two whole leg & thighs; the sauce was perfect! Made it last night. Added some mushrooms to the pan sauce. Awesome. Can this be made ahead and frozen? Trying to get some of my Pesach cooking done ahead of time. Thanks! Can I make this chicken early in the day and reheat it at seder time? Would you leave it at room tempeature during the “resting time”? Hi Helene– yes, you can, but the skin will soften and it won’t be quite as juicy if you reheat it. Also you’ll need to thin the sauce when you reheat, it thickens as it stands. I plan to triple the recipe for my seder. Should I triple all the ingredients? Also, is there any reason I couldn’t use a tin roasting pan for this recipe? Does it need to be made in a ceramic or glass dish? Way to be economical, I always say that well cooked chicken is as good as any meat. This sounds delicious! I’m pretty sure we will be enjoying this at our house on Saturday. Hi, This Honey Garlic Chicken looks yummy, will try it. The latest method of baking drumsticks by the Taiwan chef is to pan fried ( dry frying ) them !! Faster but have to take care, may be some ladies don’t this way !! What we used to do is add in 1/2 cup of water and 1 Tablespoon of corn flour, 1 tablespoon soya sauce and with the marinate of yours and stand over night. Why so much water ? To let the meat more tender and juicy after cooked. If you add in some soya sauce to marinate the chicken pieces, the color will be prettier !! Heat 1-2 spoons of oil and when it hot, place the skin side down the cover it and cook over medium fire. Turn when 1 side is golden. Before dish up add in the honey to let it cook with the drumsticks so it will shine. Dish up when both sides are golden. Cook the sauce in the same pot as all the aroma is in the pot !! i love honey on chicken and can’t wait to try this! would mashed potato flakes be a good substitute for potato starch? Hi Rick, the best substitute for potato starch would be corn starch. Potato starch is used here because it’s kosher for Passover, but corn starch will work just as well (and it’s also gluten free). That looks good. Always looking for a new spin on chicken.